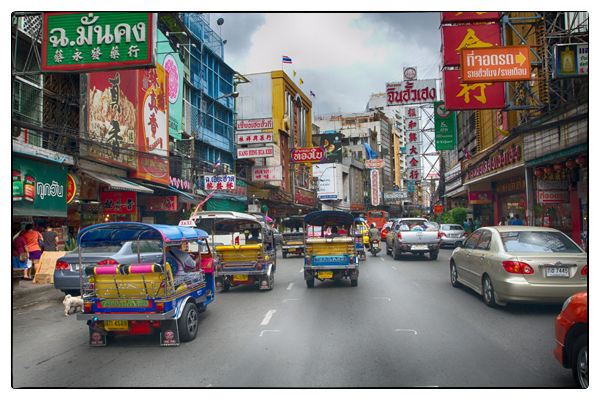 Tuk-tuks make their way through Chinatown in Bangkok. Photo by David Lansing. Tuk-tuks are to Bangkok what gondolas are to Venice. And you can’t say you’ve really been to Bangkok until you’ve gone on a breakneck, murderous ride upon one of these colorful three-wheeled motor-rickshaws. The thing about tuk-tuks is they make no sense. You don’t really get a good look at the city riding in one, particularly if you’re tall like me, because their curved canvas roofs black out a view of anything other than the potholes directly in front of you and the swerving motorbikes zipping by your side so closely that if you stuck your hand out, you’d knock the driver off. 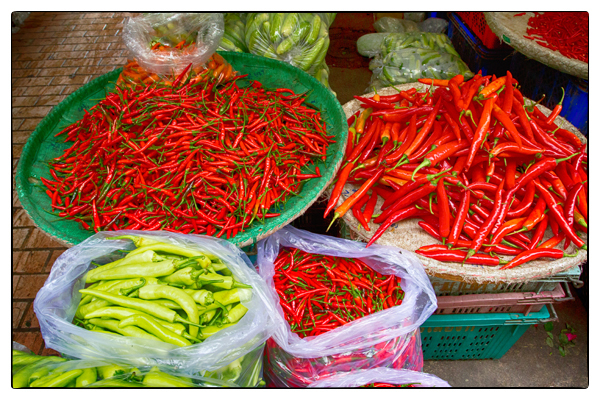 They’re stinky and foul and, what’s even more annoying, cost just about as much to ride as an air-conditioned taxi. So why do I want to ride in one? 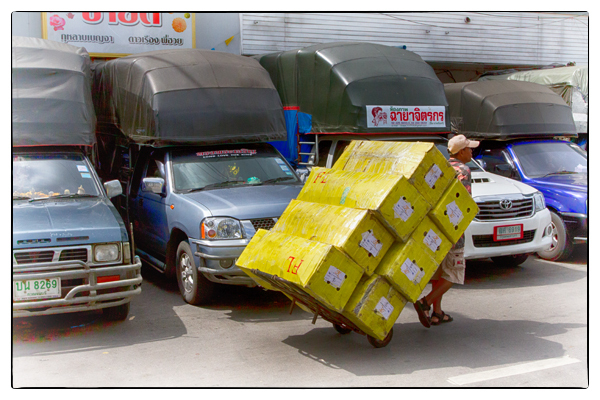 Because one senses that before too long tuk-tuks will go the way of the double decker bus in London. More and more they’re being seen for the noisy, polluting, dangerous vehicles that they are and certainly it won’t be long until they’re relegated to some sort of cultural tourism classification—you’ll pay $20 to ride a “classic” tuk-tuk two blocks along a designated area of the city and then pay another $10 to have your photo taken next to the driver who will be dressed in a sort of Disney tuk-tuk uniform. So I want to ride in a tuk-tuk that is as wild as its driver, driving up sidewalks, pulling a U-turn in the middle of heavy traffic, illegally going the wrong way down a one-way street. A real tuk-tuk, not a Disneyland ride. As we are finishing our lunch, it begins to rain. Not a light rain, but thick, heavy plops of water. A typhoon is reportedly coming down from China and this is the first warning. Back in my hotel room I watch the rain come down across the city, hoping it stops long enough tomorrow for a ride in a tuk-tuk. 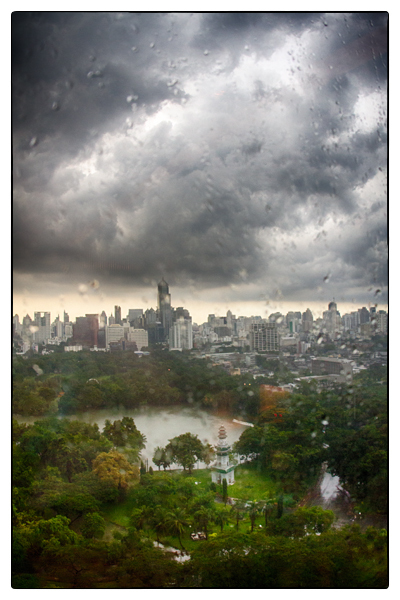 A view of the storm over Bangkok from my hotel room. Photo by David Lansing. 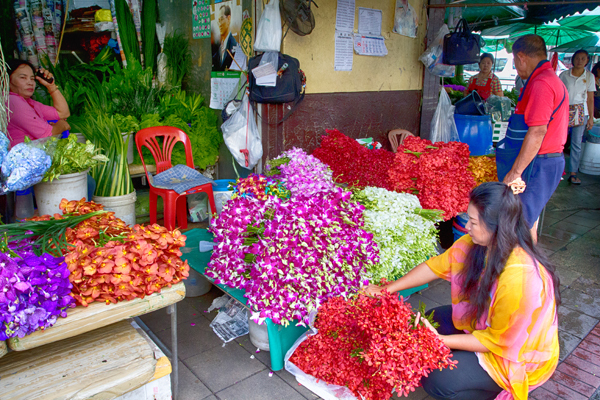 Bangkok’s flower market is open 24 hours a day but the best variety of blooms can be seen around 9am every day. Photos by David Lansing. 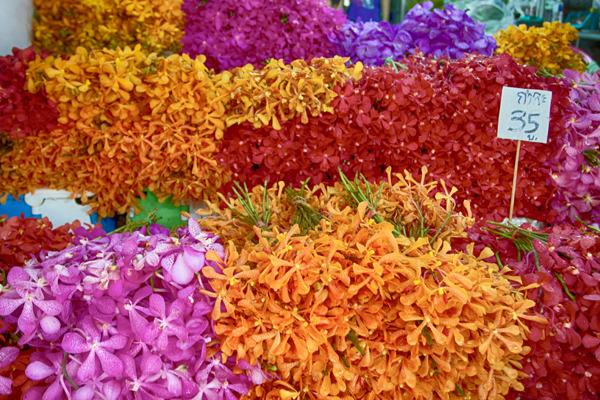 I’ve been to some of the biggest flower markets in the world—L.A., New York, Paris—but the Pak Khlong flower market in Bangkok just blew me away. It wasn’t so much that they had just about everything, from Dutch tulips to 5-gallon bags of rose petals, but that it was all so incredibly inexpensive. 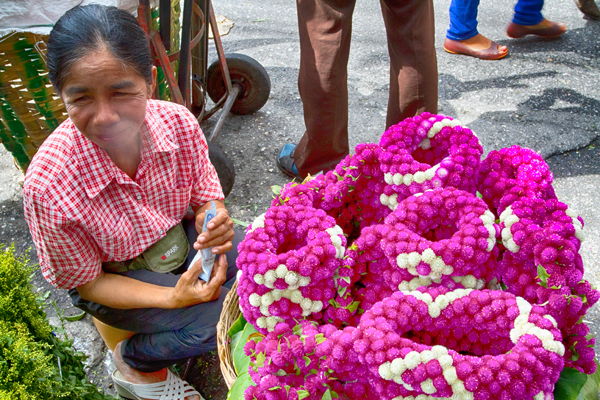 Big bouquets of orchid sprays, almost too large to hold in your fist, cost a little over a dollar; two dozen perfect pink roses were $3. 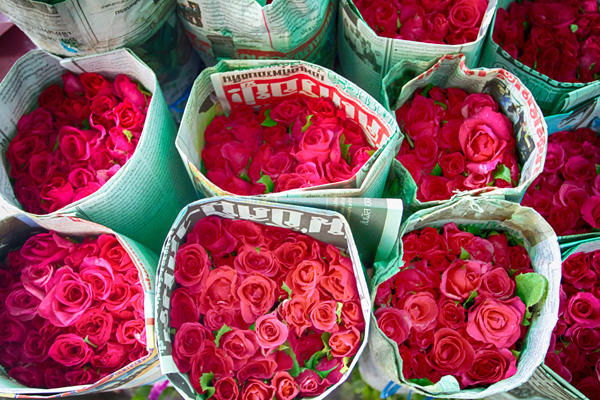 And those big bags of rose petals? About five bucks. Imagine being able to toss thousands and thousands of fragrant rose petals at a wedding reception for the price of a Big Mac Supermeal. 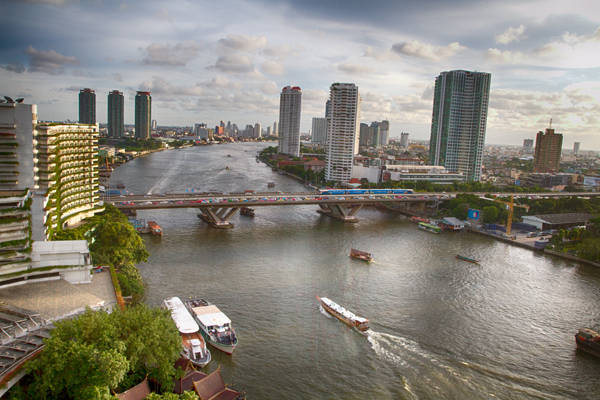 A view of the Chao Phraya River from the Shangri-La Hotel in Bangkok. Photo by David Lansing. I’m not staying at the Shangri-La Hotel but I’d heard so much about it that I wanted to visit, which I did Saturday night. Many years ago my sister-in-law was a buyer for a major clothing retailer and often took trips to Hong Kong, Singapore, and Bangkok. 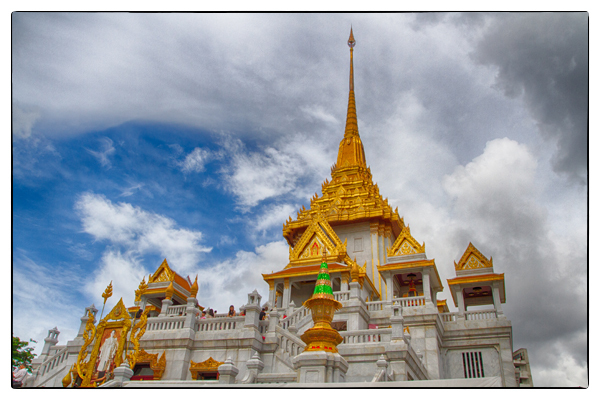 On one of these trips, my wife went with her and they stayed at the Shangri-La, which she described as the most elegant hotel she’d ever stayed in. But that was years ago. These days it’s still very fashionable for a certain clientele—families, package tours, the Chinese. 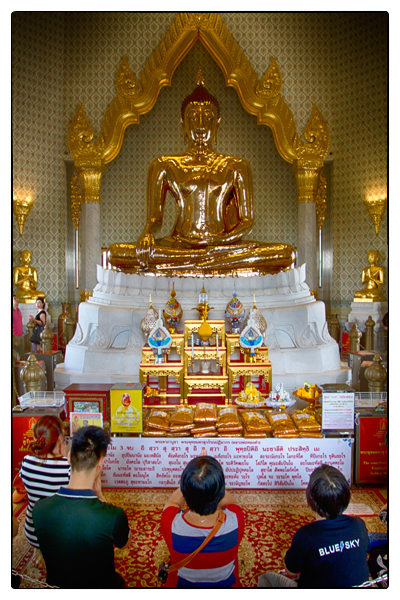 Part of the attraction is its location—right on the Chao Phraya River and just a 15 minute boatride to the Grand Palace and Wat Pho, the Temple of the Reclining Buddha. 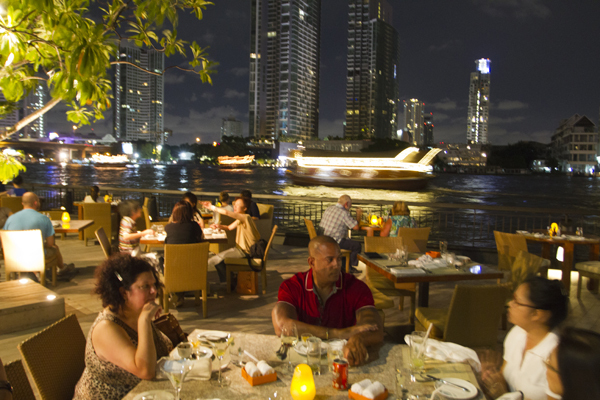 We dined at the NEXT2 Cafe, the hotel’s celebrated buffet restaurant that curls along the banks of the river. It was a warm evening but there was a slight breeze over the river to cool off the humid night. I’m not a big fan of buffet fare—the sad looking noodles, the uninspired salad bar, the always-crowded roast beef station where a bored chef in a toque ringed with perspiration slices off the smallest chips possible from a haunch of beef that has been sitting under hot lights for hours. But the chef at the Shangri-La, Lokendra Pal Singh, who was born in New Delhi, specializes in more exotic fare: tandoor dishes, eggplant and cherry tomato massala, Kashmire lamb rogan josh, and a most wonderful stuffed garlic cheese naan. 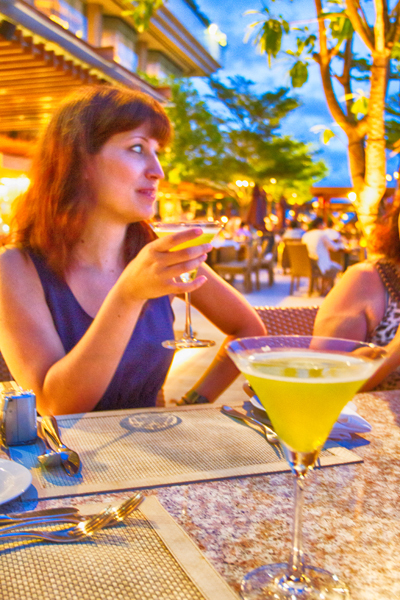 I think I could have just noshed on the naan bread and sipped their signature River Kway cocktail while watching the boat traffic go by and been perfectly happy. Which is pretty much what I did. Dinner at the Shangri-La along the busy river bank. Photo by David Lansing. The restaurant’s signature cocktail, a River Kway. Photo by David Lansing.